Optimization is the cornerstone of any successful blog. After all, you need people to be able to find the content that you create — otherwise, why make it? But the Internet changes every day, and with blog posts that stick around for days, weeks, months, and even years, your past prize pigs might not be pulling their weight anymore. So how do you make your old content work for you? And why should you revisit it in the first place? How convenient that you’d ask! Bringing your old content up to speed (sometimes called “historical optimization”) has three distinct qualities that make it worthwhile. It breaks down to this: You find old blog content on your site that performed well at the time, and then you revise it so that it’s either applicable or optimized according to today’s standards. This works especially well for evergreen content that can catch a big second wind. If you need proof that historical optimization is worth your time, Hubspot has already run the numbers, and they look good. The updates they made to their old blogs provided a huge leap in traffic, and after they worked some CRO magic, the posts started turning conversions better than ever before. In some cases, conversions improved more than 200%! If that doesn’t convince you, think about this: When’s the last time a single marketing strategy returned a 200% increase? And we’re not talking traffic — we’re talking conversions. That’s customers knocking at your door and asking to put money in your pockets. The biggest kicker about Hubspot’s experiment is an earth-shattering marketing discovery made by Pamela Vaughan. That is, in two words, completely crazy. It just speaks to the power of blogging and understanding your audience. Don’t you want your business to pull in the same amount of traffic while you take a vacation? And don’t you want more vacations?! The Hubspot team used content that they already had to draw new leads, which is an incredible testament to inbound marketing as a whole, especially content marketing. Following this model of re-optimization, the potential of the content you create has no ceiling — everything you create can fly as high as you want, provided you optimize it for today’s standards. Anyway, now that you’re convinced, let’s make it happen. Optimizing your old posts doesn’t take that much more effort or know-how than what you normally do with Google Analytics. You start by pulling a report of all of your blog posts based on their performance. You can gauge performance based on overall views or conversions — it doesn’t make much of a difference since you’ll be optimizing every post for both. It’s just a matter of where you start. The advantage to starting with views is getting your popular content to convert better on high-traffic, low-conversion pages. The advantage to starting with conversions is getting your well-converting content more visible on your low-traffic, high-conversion pages. Either way, you win. It’s just a matter of preference. If you want to start by optimizing conversions on blogs with high visibility, you need to find your most popular content. 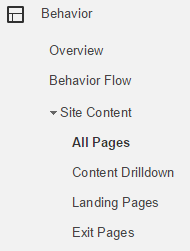 You can check blog content by going into Google Analytics and jumping to Behavior > Site Content > All Pages. After that, filter the results by /blog (or whatever your URL extension is for your blog). Now you have your pages with the highest levels of traffic. Exporting them to Excel is a great way to keep them organized so you can track what you’ve optimized so far and what still needs to be done. This strategy really shines when you’re working on material that went viral at some point. You can repurpose and repost old viral content, especially if it’s evergreen, so that it gets a second chance in the limelight to give you tons of views (and conversions, once it’s optimized). CRO is a science, but your first few attempts may feel more like shots in the dark. That’s pretty normal since CRO takes some experimentation to find something that works. But after something sticks, you can use it to your advantage day after day. You can test virtually any element on a page for conversions as long as you use the right tests for your needs. I personally like to use A/B tests, but you can also use multivariate or split URL tests. The reason I like A/B testing the best is because it’s simple, and the simpler your test is, the easier it is to identify the exact cause of a conversion increase or decrease. A/B testing also makes it easy to test one page element at a time. So if I’m redoing a call to action, I’ll only rewrite the text. If I change what the text says and its color, and then the conversions on that page increase, I won’t know what caused it. A/B testing helps you keep your tests straight-forward so you can determine what works and what doesn’t. So have patience. Test one element at a time, and keep testing to get the best results you can. You might be the tortoise in your industry, but you’ll win the race. If you want to start with high-conversion pages, you can also get your data from Google Analytics. There are a couple different ways to find your best-converting pages, so use whatever system you’ve established to find what you need. 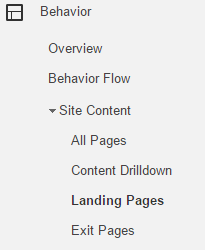 I like to find high-conversion pages by going to Behavior > Site Content > Landing Pages. There, you can sort the list of your site’s content by individual pages’ conversion rates by clicking on the column headings on the right side. Plus, you can export the information in a spreadsheet like you could when you collected information about page views. Keeping a steady spreadsheet of your top-converting blog posts is a great way to stay organized, especially as you go through posts and update them. It’s basically the same drill as before, except you’re reversing your order of priorities. After you have your list, take the blog posts that convert and update their titles, content, and other factors to current SEO standards. This works for a couple reasons. First, and most obviously, optimizing your pages makes them rank better in SERPs. Second, and less obviously, Google likes fresh content, and when you’re updating your old blogs, that’s exactly what you’re supplying. The best part about this approach is that you already know your pages convert well, so it’s just a matter of getting more traffic. Attention-grabbing titles and cleaned-up code are both great ways to attract more visitors to your site. And once you have those done, your page will naturally take care of the rest. You won’t see huge results overnight, but your repurposed content can gradually get more visibility in Google to passively attract more visitors over time. True to pretty much everything else in SEO, optimizing your old blog posts doesn’t have a stopping point. As SEO trends change over time, your older posts will gradually become outdated. And even if you do manage to update all of your old content to current standards, Google’s algorithm could change tomorrow. Plus, you can track the results of different tests you conduct to make optimization easier for future posts. If your tests didn’t deliver the results you wanted, try something new. And if you find a strategy that works, use it on other posts. And all the while, you collect conversions for your business. We have a full guide on how to improve conversion rates. It includes actionable advice and insights that your business can use whether you’re a brand-new startup or an established corporation. If you’re brand new to CRO, we also have a page about how you can design webpages for conversions. Even small changes can yield big results — and it can be as basic as changing a word in the URL — so it’s worth finding and testing different areas of your site. But what about you? Have you optimized your old blog posts? And have you seen any noteworthy changes? Let me know in the comments!